Fresh, Fast, Delicious and Healthy! 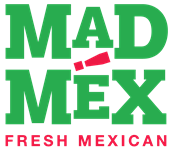 Mad Mex Fresh Mexican Grill offers gourmet made-to-order inspired Mexican dishes with a variety of gluten-free options. Completely transparent about the nutritional makeup of its food, Mad Mex have a Nutritional Calculator - Click here to view. You can use it to work out the full nutritional profile of the meal you choose. Gluten free options include authentic, fresh and healthy Tacos (soft or crispy corn), Nachos and Naked Burritos (a burrito with no tortilla) filled with roasted, grilled and slow-cooked meats, or veggies and tofu, all perfectly complemented by your favourite Mexican toppings and hand-made salsas. The Mad Mex 1-2-3 step menu is fully customisable allowing customers to build their meal to their individual tastes or specific nutritional needs. If you love fresh hand-made guacamole with your naked burrito, chipotle marinated pollo (chicken) in your tacos and crave amazing flavour, Mad Mex is the fresh and healthy choice for you. The food is made with authentic ingredients that embrace the traditional Mexican methods of cooking with menu items such as black beans, slow roasted meats and salsas made from scratch, reflecting the Mad Mex commitment to authentic Mexican cuisine. Mad Mex restaurants that are fully licensed also offer signature $9 margaritas made with 100% agave tequila, and a selection of Jarritos, an imported Mexican soft drink – Be sure to add one to your meal! Click here to view other Mad Mex locations featured on this directory.